Localization (l10n) is the process of making a product suitable & accessible for population other than the one it was originally developed for. Internationalization (i18n) is the mechanical process of building or modifying a product to support different locales. Localized websites benefit from a substantially better UX, higher ROI and exposure to foreign markets, that is a fact. Even though, only a small portion of existing websites have seized that opportunity. Currently, over 65% of global Internet users Localization needs are unattended. What’s the big issue? Why doesn’t everyone do it? Locating trustworthy translators in all desired locales, controlling the flow of information from and to the translators, integrating the output in the website and the need to analyze and decide on one’s localization needs makes Localization a cumbersome, expensive and time consuming challenge which acts as a barrier, preventing many organization from completing the process. Organizations that follow through will face the burden of maintaining a Localized website, one which requires the process to repeat itself on every site update. Developers do not like to create a Internationalization ready site. It’s time consuming and boring. Trust us. We’ve been there. It is out of reach for Front-end developers – a large portion of the web developers community. As always – the result is that making Internationalization ready sites is expensive and converting an existing site into one can cost as much as creating a brand new site. The complications that arise when looking into website localization are why so many websites still focus on only one language, leaving a huge portion of their market untapped. 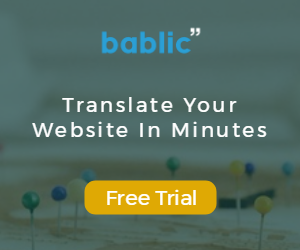 Bablic is now changing that and providing an easy way of making websites multilingual without all of the burdens once attached to the process.